Interior Secretary Ryan Zinke defended the administration's reversal of the elephant trophy ban during a press conference on Capitol Hill on Wednesday morning. "Let me make it absolutely clear: We are 100 percent aligned with the president's policy," Zinke told reporters. "The court itself said that we had to change our process, but the policy remains the same. We are 100 percent aligned with the president's policy." As part of an ongoing lawsuit, the U.S. Fish and Wildlife Service announced last week that it rescinded a ban on importing elephant trophies and other decisions about permits import trophies from big game animals. The agency said it will now consider applications for the permits on a case by case basis. In a statement about the decision the agency said "the President has been very clear in the direction that his administration will go" and a separate statement from the Interior Department said the president and Zinke's views on the issue have not changed. The U.S. Fish and Wildlife Service would not comment further on how the permits will be considered. The White House did not respond to a request for comment on Monday. The agency announced the change after a federal judge ruled the government had to reconsider the ban put in place by the Obama administration because the rule was created internally instead of going through the public comment process. The Trump administration announced that it would lift the ban last year but quickly put the decision on hold after intense public backlash. President Donald Trump tweeted at the time that he was putting the permits on hold to review the information. The president also tweeted that hunting elephants was "horror show" and said in an interview a few months later that he didn't support the practice. 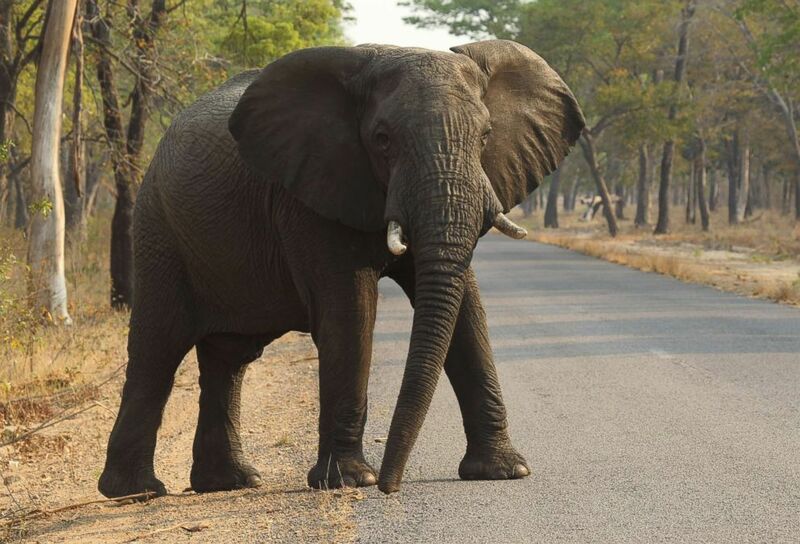 (Tsvangirayi Mukwazhi/AP) An elephant crosses the road in Hwange National Park, about 435 miles south west of Harare, Oct. 1, 2015, Zimbabwe. Fourteen elephants were poisoned by cyanide in Zimbabwe in three separate incidents, two years after poachers killed more than 200 elephants by poisoning, Zimbabwe?s National Parks and Wildlife Management Authority said, Oct. 6, 2015. Permits to bring trophies from elephants killed abroad would not apply to ivory, which is illegal in the U.S. The president's sons have been pictured on big game hunts and even standing next to a dead elephant while holding its severed tail. They have said that hunting is an important part of conservation efforts. Members of Congress and animal advocacy groups condemned the administration's new policy this week and said it is not in line with the president's previous statements about the policy. Members of the Congressional Animal Protection Caucus Reps. Earl Blumenauer, D-Oregon, and Vern Buchanan, R-Florida, called on the president to preserve the ban in a statement. "This news is disappointing and disturbing and is a clear break from the president’s promise to uphold the current ban on these imports. Elephants need protection and subverting this ban only puts these animals at risk. As co-chairs of the Congressional Animal Protection Caucus, we urge the president to uphold his executive authority and fully retain the ban,” they said in a statement. Sen. Jeff Merkley, D-Oregon, tweeted that the move was "enraging." Other advocacy groups like the Humane Society of the United States, which is involved in the lawsuit with the government over the issue, said the move will move more of the decisions behind closed doors. "We are extremely troubled by the fact that they are attempting to do business as usual just under a different name," Humane Society attorney Anna Frostic said in an interview on Monday. More filings and rulings are expected in the ongoing lawsuit in the coming weeks.